Recognizing what was being lost, some perceptive observers began to sound the alarm. One of them was a remarkable Presbyterian pastor in St. Louis, Missouri. The Rev. Frederick Starr loved trees and deplored how they were being wasted. "Destructive man," he said, "so utterly robs and impoverishes his lands of timber that he destroys the beauty of the landscape, and beyond the fence of his 'wood-lot' leaves no shade for man or beast." Starr knew there was a better way. “God,” he said, “has given us a great and goodly heritage—a grand and broad and luxuriant country; but it is our forests that have made this country so salubrious, so fertile.” With such blessings at hand, Starr believed an American Eden was still possible. And with that thought in mind, he posed a question for his countrymen: “Shall we not preserve and cherish with care what remains, and plant on every quarter section destitute of trees, in all our land, its proper complement of forest, until from sea to sea, it shall seem to all men “like the garden of the Lord?" Sadly, Starr did not live to see his legacy. He died in 1867, weeks before his 41stbirthday. Nearly forgotten today, he deserves to be honored, not only as a forestry pioneer, but as a Presbyterian who cared about creation and sought to restore it. 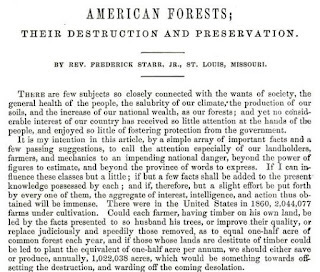 It is unclear when or how Starr developed his special interest in forestry. His first exposure to lumbering may have come in connection with his father’s furniture- and cabinet-making business in Rochester, N.Y. Deeply religious, the elder Starr was no doubt pleased by his son’s decision to enter the ministry. After graduating from Yale College in 1846, Frederick earned a degree at Auburn Theological Seminary. In 1850, he married Helen Mills, daughter of an Auburn professor, and accepted a call to serve as pastor at a Presbyterian church in Weston, Missouri. When he arrived there, the Civil War was more than a decade away, but by the mid-1850s, tensions in the area were high as pro- and anti-slavery forces faced off against each other. In the summer of 1854, members of a pro-slavery group asked Starr to answer charges that he had taught a school for blacks, advised two slave owners to free their slaves, and ridden in a buggy with a black “wench.” Starr ably defended himself and frankly stated his conviction that slavery was “a moral and a political evil.” He remained a lightning rod for controversy until his departure from Weston in the spring of 1855. According to one story, “he was forced to flee in the dead of night" to avoid a hangman’s noose. Starr returned to New York state where he remained for the next decade. 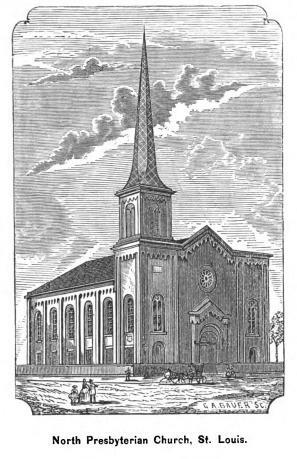 Then, just after Lee surrendered to Grant, he became the pastor of North Presbyterian Church* in St. Louis. Family connections may have figured in his decision to accept the call. His wife’s sister Margaret was married to Henry A. Nelson, pastor at that city’s First Presbyterian Church. All too soon, the Rev. Nelson found himself delivering a sermon to memorialize his late brother-in-law. Nelson marveled at how much Starr had accomplished during his brief tenure at North Presbyterian, and he thought overwork had been a factor in his demise. Besides ministering to his congregants and lending his support to the local Girls Industrial Home, the Colored Orphan Asylum, the Sunday School Teachers' Association, and various temperance organizations, Starr had found ways to “repair and beautify” the North Presbyterian church building and pay off a $15,600 church mortgage (equivalent to more than $250,000 today). On top of everything else, there was the forestry paper chosen for inclusion in a federal report. 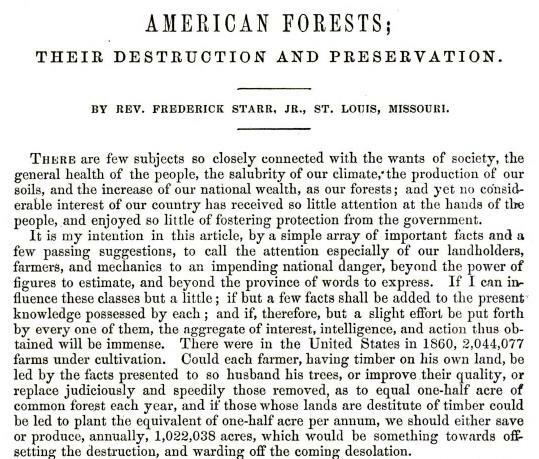 “I knew how he loved trees,” Nelson recalled, and how “he lamented the wanton waste and destruction of them, and earnestly felt the necessity of a great movement to arrest it.” But when Starr showed him a copy of what he had written, Nelson read it in amazement. He had no idea how his brother-in-law had ever found time to produce such an impressive treatise. Nelson said Starr was “one of those men who go about amid the beauties and wonders with which God has filled the world, with their eyes open, and their minds awake. He found ‘books in the running brooks, tongues in the trees, sermons in stones, and God in every thing.’" The somewhat altered quote was from Shakespeare’s play As You Like It, and at least in the printed version of Nelson’s sermon, “God” took the place of Shakespeare’s “good.” Judging from our small but intriguing window into Starr’s feelings about God’s creation, it was an appropriate substitution. *The North Presbyterian Church no longer exists. The congregation moved to another site in the early 20thcentury and disbanded in the 1940s. But the building where Starr ministered still stands. It is home to the Saints Cyril & Methodius Polish National Catholic Church. Every other year our denomination, PC(USA), holds its national meeting called General Assembly that is attended by thousands of Presbyterians. 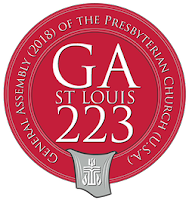 This year will be the 223rd meeting and it will be held in St. Louis, Missouri, June 16-23. At this meeting, overtures (proposals) are brought before the commissioners who vote on their approval. PEC is supporting three overtures this year. 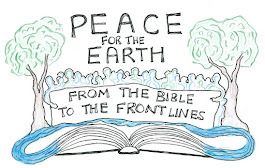 Hudson River Presbytery (NY) and forty concurring presbyteries are proposing to direct the Board of Pensions and the Presbyterian Church (USA) Foundation to divest from fossil fuel companies and to actively invest in securities that focus on renewable energy (OVT 08-01). One overture from Monmouth Presbytery (NJ) asks our denomination to raise a prophetic voice regarding the urgency of healing our climate (OVT 08-06). A second directs our denomination to be active in responding to environmental racism (OVT 08-05). PEC has a presence at these meetings where volunteers enjoy catching up with old friends and making new acquaintances. A highlight of our time together is the PEC Luncheon and Annual Awards that will be at noon on Tuesday, June 19 at the Marriott Grand. Jimmie Hawkins, Director of the Office of Public Witness, will be our guest and discuss the "Poor People's Campaign: Race, Poverty and the Environment." We will also recognize our 2018 award winners for the William Gibson Eco-Justice Award, the Restoring Creation Award, and the Emerging Earth Care Leader Award. Luncheon tickets, including discounted young adult/limited income tickets, may be purchased onlineand at the booth by Saturday, June 16. The best place for meeting up is in the Exhibit Hall where PEC’s booth will be located next to our friends from Fossil Free PCUSA. At the booth, we will focus on single use plastics and what we as individuals can do to stop the horrendous volumes that end up in our oceans and threaten the lives of God’s marine creatures. You may also enter our daily drawing to win a free PEC t-shirt or the book, “Creation Care: A Biblical Theology of the Natural World.” Please stop by to introduce yourself and meet PEC’s new moderator, Dennis Testerman. We hope to see you there! The Future is Bright with Solar! 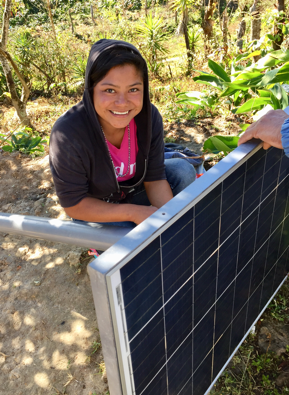 Connections were made on so many levels recently when Solar Under the Sun (SUS) supporters from three U.S states partnered with many others in the country to help light up several small communities in southwestern Honduras. At the end of the installation week,14 families in the beautiful, coffee-covered mountains near Comayagua now have clean, sustainable power in their homes for the first time! 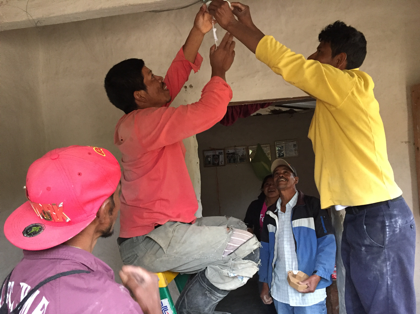 SUS has a covenant with the rural communities of El Horno, El Sute, and Agua Zarca, to install smaller one-panel 12V systems (the "FS-12" system) in 76 homes in the area. 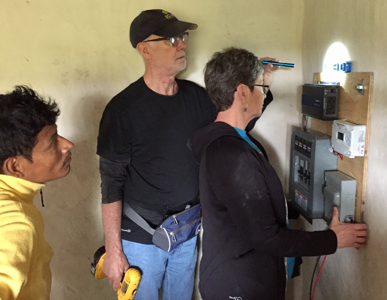 To install these systems, graduates of SUS Solar Schools from several Presbyterian churches, Spring Hill-Mobile (AL), Second-Little Rock (AR), Broadmoor-Shreveport (LA), and First-Jacksonville (FL), traveled together to Honduras February 20-28. This was the third trip for this pilot “SUS Initiating Partner” project. The first survey trip was in June 2016, and since the first installation trip in January 2017, 38 homes have been completed. Nine other homes in Las Glorias, Honduras were installed several years ago. Solar Under the Sun, which began in 2009 and initially retrofitted with solar water purification systems, is lighting the way in many new ways - and you can be a part of it. Please visit www.solarunderthesun.org to learn more about how you can support this wonderful mission or to register for the next open biannual Solar School on Oct 11-14 at Ferncliff Camp and Conference Center near Little Rock, Arkansas!